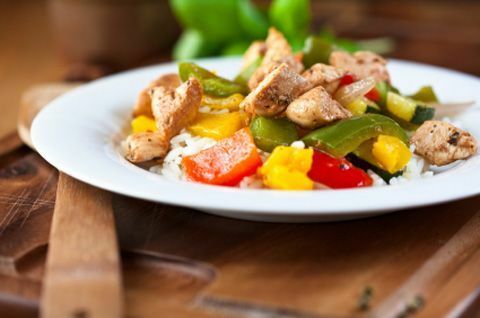 Sauteed sweet peppers dress up plain chicken. Serve on top of a bed of brown rice. Sauteed sweet peppers dress up plain chicken. Serve on top of a bed of brown rice. 1. Sprinkle chicken with salt and pepper. 2. Lightly coat a nonstick skillet with cooking spray. 3. Cook chicken over medium heat until light brown (about 15 minutes), turning once. Reduce heat. 4. Sprinkle garlic, lemon, half of tomato, onion, parsley and oregano over chicken pieces in skillet. 5. Add wine and broth. 6. Cover and simmer for 15 minutes. 7. Add remaining tomato and sweet peppers, cover and continue to simmer for 7-10 minutes or until chicken is tender and cooked through.